This is old version Marvel Puzzle Quest 106.354840 apk for Android, you can install it if you want to downgrade or install old app. It is top Puzzle apps from D3 Go!. Any puzzle game will never be interesting without the presence of the rank and competition. That’s why the rank is capable to be found in some session. They are Tournaments, Season Play and even Alliances. Each of the achievement you made will be replaced with new character as well as some attractive prizes. Although the game is only formed as a puzzle game, it will give you a very great RPG leveling. This is one of the gaming aspects which always hunted. Now, you can have the power to against the other player as well. Mature strategy is totally needed to ensure about the total results from the game play you made. As the game with so many players inside, you will also be available to get 8 million players worldwide attention. Specially made by many Marvel writer, this game has a powerful gameplay to be done. 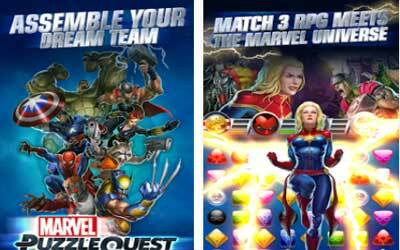 Just get Marvel Puzzle Quest for Android and start your fun. Championed characters are considered to have 5 power levels in every power when sent as a Team-up. Selecting a mission now takes the player into the mission description. The Alliance Icon now shows an alert you when you receive a Team-up. The game should no longer crash when playing against certain enemy combinations in Wave Missions.